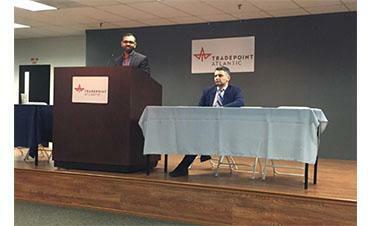 Prem Pereira, construction project manager for Orsted (left) and Francesco Onorio, head of project development for U.S. Wind, speak at the Business Network for Offshore Wind's Supply Chain Connect event Wednesday in Tradepoint Atlantic. The developers of Maryland's two offshore wind projects have put out a call to local companies: "We want you." U.S. Wind and Orsted are working to develop a supply chain of companies that will construct, operate and maintain the nearly 50 offshore wind turbines set to be built off the coast of Ocean City. The developers are looking for small and large companies specializing in an array of services, from metal fabrication to support vessels and underwater cable installation. And with a charge from Maryland's Public Service Commission, to spend, invest and hire locally, the developers are particularly interested in working with companies based in the state or looking to open facilities here. Representatives from each of the development firms spoke to potential supply partners at an event in Tradepoint Atlantic on Wednesday in an effort to make connections and build a supply chain — one of the next major steps required to bring the projects to life. Developers U.S. Wind and Orsted were selected by the PSC in May 2017 to build a wind farm in two wind energy areas that make up 80,000 acres off the Ocean City coastline. In total, the projects have the potential to create over 7,000 new, largely blue collar jobs, in fields such as welding, engineering, electrical work and others. Per conditions of the PSC's approval, the developers are also required to invest millions of dollars into a Maryland steel fabrication plant, at a Maryland port facility such as Tradepoint Atlantic, a business development fund and an operations center in Ocean City. If the wind farms are completed quickly, they may be the first commercial scale offshore wind project in the U.S., making Maryland a national leader in the offshore wind industry. Francesco Onorio, head of project development for Baltimore-based U.S. Wind, said his company is already working with several local, tier one contractors, such as Baltimore's Maritime Applied Physics Corp. and Strum Contracting Co. But there are plenty of opportunities for other companies at the tier one level, down to the smallest piece of the supply chain, he said. Onorio said U.S. Wind is first and foremost looking for companies with "local knowledge" and "the best people." Although the PSC's conditions do require at least 19 percent of the money used to develop and construct the wind farms be spent in Maryland. 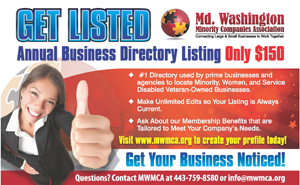 The developers are also tasked with involving small, minority- and women-owned businesses. U.S. Wind is close to submitting its construction and operation plan to the Bureau of Ocean Energy Management, which will allow the project to move ahead. The development company is looking to have its 250-megawatt, 32-turbine wind farm operational by early 2020. Developer Orsted is moving at a slightly slower pace, aiming to have its 120-megawatt, 15-turbine wind farm Skipjack operational by late 2022. Deepwater Wind was originally the developer of Skipjack before Denmark-based Orsted acquired the Rhode Island firm in late 2018. Orsted's seven-person team in Annapolis has been working on the permitting process for the project, and putting together its construction and operation plan since opening the local office in spring 2018. Development manager for Skipjack, Joy Weber, said Orsted has not yet announced the tier one suppliers it plans to work with, although they are in talks with several companies. The European company already has existing supply chains from projects completed overseas, but Weber said for the Maryland project, the firm will bring in a mix of new and existing contractors. She added that events such as Wednesday's hosted by the Business Network for Offshore Wind was "timely" for meeting potential supply chain contractors. Liz Burdock, CEO of the Business Network for Offshore Wind, and Russell Williams, a business development associate at Tradepoint Atlantic, both reiterated the magnitude of the opportunities for Maryland businesses to get involved in the office wind industry. They spoke about the declining cost of constructing offshore wind farms — down 13 percent in Maryland since 2012 — as well as the increasing number of projects in the pipeline up and down the East Coast. The sheer size of the projects also reveal the large number of opportunities for local companies. For example, Burdock said at any one time, nearly 100 vessels may be deployed in the water or air to support the construction or maintenance of the turbines. There is also potential for Maryland to become the leading state in the U.S. offshore wind industry, which could allow local companies to use their expertise to work on projects in other states.